Each year when I see this plant growing in the fields, I think how it simply defines what true yellow is for me. Not any particular shade, though it looks a bit yellow green to me here. It's always a stunning scene around April and May when the colza, a.k.a. 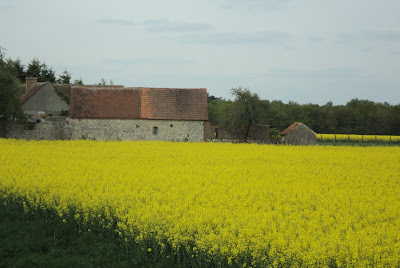 rapeseed, is in full bloom. We've got loads of fields full of it around here. It's what canola oil is processed from. It's readily available here and likewise touted for its omega-3 fatty acids... I prefer olive oil, tastewise, but colza wins hands down for being more picturesque in my book!